China's Chang'e-4 lander touched down on the far side of the moon (Jan. 3 Beijing time, Jan. 2 US), and it's got some living things on board. A small "tin" in the lander contains seeds of potatoes and rockcress (Arabidopsis thaliana, a flowering plant related to cabbage and mustard, as well as a model organism for plant biology), as well as silkworm eggs. The idea, according to a report in The Telegraph earlier this year, is that the plants will support the silkworms with oxygen, and the silkworms will in turn provide the plants with necessary carbon dioxide and nutrients through their waste. The researchers will watch the plants carefully to see whether the plants successfully perform photosynthesis, and grow and bloom in the lunar environment. The "biosphere" experiment was the product of a collaboration between 28 Chinese universities, led by southwest China's Chongqing University, according to Xinhua. The experiment, which is tucked inside a 1.4-pint (0.8 liters) aluminum alloy cylinder, weighs about 7 lbs. (3 kilograms) and includes dirt, nutrients and water. Sunlight will filter into the container through a "tube," and small cameras will watch the little environment. That data will beam back to Earth by means of the complicated relay system China has set up to communicate with an experiment that has no direct line of sight to Earth. "Why potato and Arabidopsis? Because the growth period of Arabidopsis is short and convenient to observe. And potato could become a major source of food for future space travelers," said Liu Hanlong, chief director of the experiment and vice president of Chongqing University, as reported by Xinhua. "Our experiment might help accumulate knowledge for building a lunar base and long-term residence on the moon." Rockcress has been grown in space before, including in one experiment on the International Space Station that showed the plants' leaves appearing to rise and fall as they detected the moon's gravity. 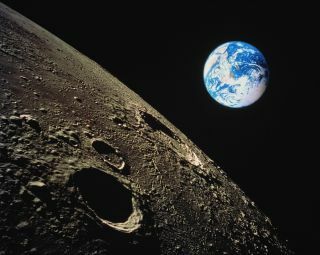 But whether the flowering plant will flourish in the environment of the far side of the moon remains an open question. For now, though, this means that there's life in at least one other place in the solar system (even if it's only because we put it there).